For those in a hurry, we offer a special selection of shelves that are immediately available. These Z series classics are with you in one to three days. Design your Z shelf, save, and send your draft to your email. Finalize it whenever you want. The smallest configurable Z shelf consists of three shelves. The largest configurable Z shelf consists of three interconnected Z shelving units, each consisting of seven shelves. If you configure two or three Z shelving units in a row, your order will automatically include row connectors for secure attachment. If your Z shelf stands freely in the room, it should consist of a maximum of four shelves. Five or more shelves will automatically add wall brackets to your order, allowing you to securely attach your Z shelf to the wall. Our Z shelf offers you plenty of storage space and is extremely durable. The powder-coated steel Z shelf looks neither massive nor overloaded. On the contrary: Due to its airy construction without a back panel, it not only offers a wall shelf but is also ideal for partitioning rooms. The name of the Z shelf is derived from its construction, which is only visible at a second glance. Namely, just when you look under the shelf. There you'll find the Z-shaped support structure which results from the connection of the legs and the cross beams. Thanks to its large shelves, a lot of stuff fits neatly into the Z shelf (each compartment space is about 147 cm in length, 35 cm tall and 37 cm deep). If you prefer to display or decorate, the generous construction will give your objects the necessary air to breathe. Z Shelves with a maximum of four shelves (132.8 cm total height) are ideal as freestanding shelves, e.g., for dividing rooms. Z shelves for wall mounting, which consist of a maximum of seven shelves (252.8 cm total height), can be much higher. The Z shelf is made of powder-coated steel. In conjunction with the Z-shaped support structure, it can withstand heavy loads (about 50 kg per shelf). Its figure conveys the exact opposite: reduced and functional. If you take it "as is," the Z shelf is a bit deceptive in its packaging. It's very distinctive, and thus, scaled back and seems to be the most practical. Someone who doesn't know better could speculate that the shelf is pretty but certainly not very robust. Howeverrr: Far from it! If you look closely or accidentally run against it in our store, you'll become aware of its stability. Because not everyone can come to Berlin, our photographers took a look under the shelf and photographed the durable, Z-shaped steel construction for you. If you are looking for facts: The load capacity per shelf is 50 kg. 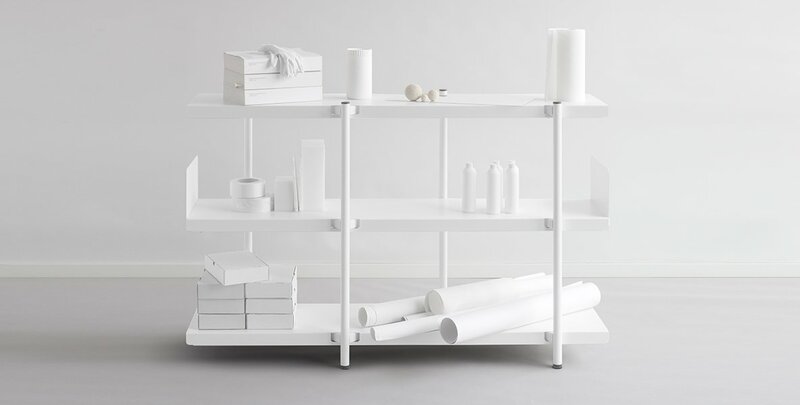 A Z shelf with seven shelves can, therefore, carry around 350 kg. In the standard version, the Z shelf is black or white, and its surface is slightly beaded. If you want to make your room or your wall pop, there is a range of eye-catching special colors with a mostly glossy surface available. 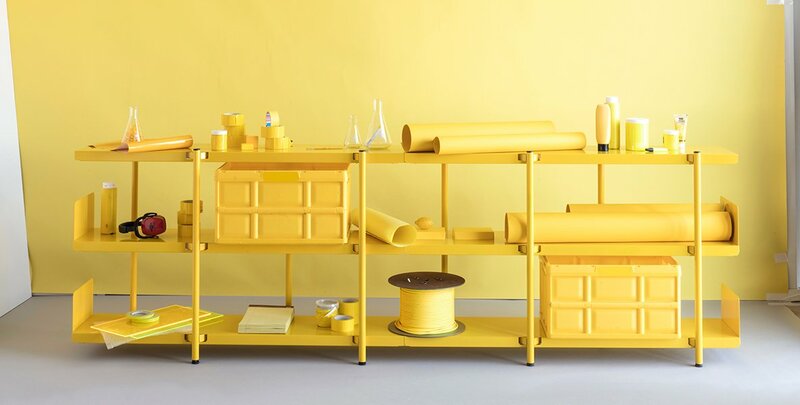 For example, our rapeseed yellow Z shelf, which lives up to the terms "color blob" and "color accent," shines like the sun. It's particularly impressive when you string together several shelves or stack in the air. From experience, we can say that such a colorful shelf, especially in winter months, raises the mood and gives hope for better days. Z Shelves, with a maximum of four shelves and a height of approx. 133 cm, are ideal for dividing work and living areas. Up to this height, it's ensured that the Z shelves can be safely left to stand free. At the same time, they offer you the opportunity to look through to the other side easily. If you also take up to three Z racks and line them up, you have a room divider up to 4.40 m in length. If you want to go high, you can configure a Z rack with up to seven shelves. The highest shelf, with about 2.53 m, is ideal for high-ceiling rooms and looks especially strong in black in front of a white wall. To ensure that everything is safe, Z shelves with five or more shelves are only intended for wall mounting.